Correcting aggressive behavior from your horse is necessary if directed toward humans, but it’s also dangerous. If at any time you feel fearful, seek professional help. Your horse will pick up readily on your fear and hesitancy, and become even more confident in his aggression and his role as your leader, instead of the other way around. Use lungeing to establish or re-establish your role as your horse’s leader. Take him into a round pen and free lunge him. If he stops before you ask him to stop, snap a lunge whip or rope behind him. If he still doesn’t move forward, move more aggressively with the rope and snap it again. You may have to snap it on his hindquarters if he doesn't respond, but don’t do it hard -- you only want to apply as much pressure as it takes for him to go forward. If at any time he reacts aggressively by turning his hind end to you or kicking at you, respond immediately with the rope behind him to keep his feet moving. Ask him to change direction several times by turning to the railing, not toward you. When he obeys your commands the first time you ask, and starts relaxing by licking his lips and lowering his head, ask him to stop. Make sure he stands still while you approach him and praise him. If you don’t have a round pen, put your horse on a lunge line, but make sure you are a safe distance away from his hind end if he tries to turn and kick you. Some horses kick only at meal time, so don’t reward your horse by giving him food so he stops kicking, as that only reinforces his behavior. 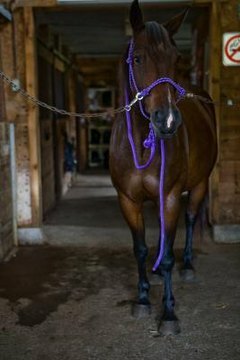 If he kicks out while eating, risking injury to himself or destroying his stall, try a kick chain, which is a chain attached to a leather bracelet that you secure around the horse’s foot. When he kicks, he causes the chain to hit his foot. There also are devices you can secure to your stall that operate on a sensor, squirting your horse with water when he kicks. If your horse kicks at humans, augment round pen work with a rope halter lesson, asking your horse to back up, and disengage his hindquarters and forequarters. It doesn't matter if your horse bites out of aggression or playfulness, they both hurt and are unacceptable. Stop all hand-feeding; if treats are important to your horse's training, feed them from a bucket or other container. When he tries to bite you, or if he succeeds, give him an immediate and harsh verbal reprimand. If he doesn't stop, pinch him in the nose immediately after he bites, or tries. He will come to see his biting as causing the pinching. Don't hit him in the head or face. If your horse is aggressive with other horses, you don’t have many options except to change the herd dynamic. Horses have a natural pecking order and humans can’t change it. If he continues to bite, kick, strike or chase other horses that cannot get away, or eat and drink in peace, you either must remove your horse or find a group setting that works. If the behavior is sudden or otherwise unusual, have your vet examine your horse to rule out hormonal or other medical conditions.